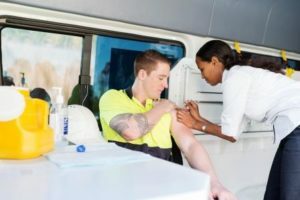 Influenza (the flu) is the most common vaccine-preventable virus in Australia. According to Australian data, there are approximately 4000 hospitalisations and 85 deaths annually from the flu[i]. These statistics underestimate the true burden of the disease as hospitalisations are not the only measure that estimates burden. There are different types of the influenza virus but only two types are included in the seasonal Influenza vaccination program. Type A and type B viruses are most common and vaccines are developed by targeting proteins on the surface of the virus. The virus can change by two main methods which are referred to as Shift and Drift. Shift refers to a major change in the surface proteins. Drift signifies smaller changes which occur over time. The newer strain of the virus could be closely related to the older strain but your immune system may not recognise it. The drift means that annual vaccination is required as newer strains of the virus may develop each year. Over the course of recorded history there have been times when pandemics have occurred. A pandemic is where large numbers of individuals worldwide are infected with the flu. The most recent of these was in 2009 and involved the H1N1 virus (swine flu). A vaccine this virus has been included in the last few years to protect against this strain of the virus. The most devastating pandemic known was the Spanish flu which occurred during World War I. This led to millions of deaths which eclipsed those killed directly by the war itself. Recommendations by the World Health Organisation (WHO), after convening in October 2016, determined that the above viruses are most likely to cause infection during the 2017 influenza seasons globally[ii]. Until 2016, vaccines were predominantly trivalent. They now contain the four aforementioned strains which are considered quadrivalent. This means that you are protected against an additional strain of virus with this year’s vaccine.